Czech two-holed Superduo seed beads. Superduo offers much more creativity and possibilities. 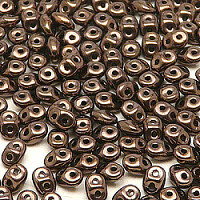 The oval shape of the two-holed seed bead has dimensions of 2.5 x 5mm. Superduo enables original, interesting and effective work and the two holes multiply the options for the seed bead’s use. It is possible to create unique spatial shapes, original structures, lacy designs or exceptional seed bead costume jewellery using the new Superduo seed beads.